House fires are an all-too-common danger for people throughout the United States. At TRAC Solutions in the Chippewa Falls area, we deal with the aftermath of house fires every single day. If you ever find yourself in a house fire, it is critical that you understand smoke inhalation and its implications for your health. Are you susceptible to smoke inhalation? What are the symptoms? What do you do to avoid smoke inhalation while in a house fire? There are certain conditions that pre-determine one to become more likely to be adversely affected by smoke inhalation. If you have any of these following conditions smoke inhalation could be more dangerous for you: lung disease, angina, ischemic heart disease, chronic obstructive pulmonary disease, emphysema, and asthma. The symptoms of smoke inhalation are fairly straightforward. Burning eyes, runny nose, cough, phlegm, wheezing and difficulty of breathing are the most common symptoms. More serious issues are the worsening of symptoms for those with heart or lung disease. Those with heart disease may experience chest pain, palpitation, shortness of breath, and fatigue. Also, those with lung disease may have coughing, phlegm, chest discomfort, wheezing, and they may not be able to breathe as deeply as usual. What Do You Do If You’re In A House Fire? As destructive as the actual heat from a fire can be, the smoke resulting from the fire can be similarly destructive if it is inhaled. If you find yourself in a house fire, it is important that you take the following steps to avoid the issues of smoke inhalation. First, you should stay low to the ground as smoke rises. You will still inhale much more smoke than is healthy being low to the ground, but it is far superior to being closer to the ceiling. Furthermore, you may feel that running will be faster and, therefore, safer, but running in the smoke can make you disorientated and put you in an even worse circumstance. Next, you should place a wet shirt or rag over your mouth and nose to filter out some of the smoke you are breathing in. However, you may not want to do this in many circumstances. The wet rag will only buy you about another minute that you would have without it so if you don’t have a way to easily access one you should just move on. Last of all, if you find yourself trapped in a room and waiting for help you should cover all the vents, close your door, and block all the cracks in any doors using towels or clothing. 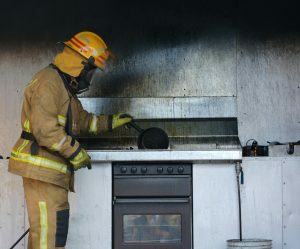 We hope these facts are helpful for in understanding the effects of smoke inhalation and can give you some peace of mind regarding what to do in a house fire. Nonetheless, for any further questions you have or any help for fire damage cleanup and restoration, our certified restoration professionals at TRAC Solutions in the Chippewa Falls area are here to help!